Forecast was for very little wind and they weren't wrong. Start moved down to North Head so a couple hours spent motoring down the Solent before they got the race away 13:15. OK start but just could not get the boat moving except when we got the Code Alpha up for a bit. 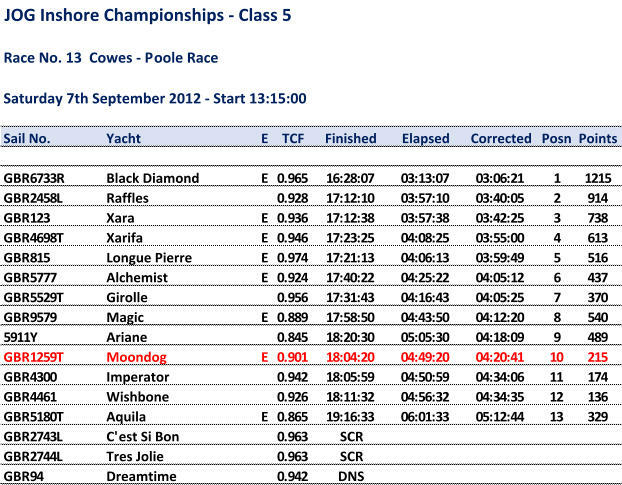 Spinnaker up for the rest of the race but our 0.9oz was really too heavy for the conditions. Came in 10th which was disappointing but a lovely meal in the Storm restaurant and a coupe of beers in the Nelson.